Yeah, weird, but that's my name. Hurriedly written and thought, distractedly drawn, blindly invoked and sold, as well as consciously forgotten. As if, with due care, from the previous to the next, the popular, international heartbeat makes a perpetual leap. The perfect alibi to move on and talk about something else, that’s unjust amounts and undue subtractions, remaining on the subject. Indeed, on the task of human lives math. So, in these days, it happens that twenty-six young Nigerian girls were found dead on a migrant ship in the Mediterranean Sea, and yet guilty inside the common sense. Their is a minor death, after a superfluous existence for the still earth's inhabitants almost as much as their heart. Twenty-six is mine and their name. As many people killed in the massacre of the Baptist Church in Sutherland Springs, Texas, which was once again squeaked in a loud voice and then buried in the dusty archive with the nameplate: unmanageable attacks. 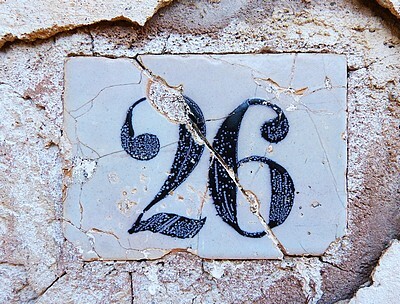 At the same time, twenty-six is the last killer’s age, not the terrorist, the mad man, not the enemy of our civilization, the poor soul, yes, no doubt about that. Twenty-six I was born, what can I do? That’s why I exist silently, to better light the useful figures. Yet, rarely, it also happens to rejoice for good fortune. Like the twenty-six wounded, but survived at the recent flood of a river in Colombia and the many survivors in the fire at a building of the Moncton University, Canada. Despite that, even for the prime numbers to perish, the fortuitous exception confirms the sad rule. It tells us of twenty-six ignored deaths in India for the explosion of a coal-fired power plant. Twenty-six, this is what I am. Twenty plus six, name added to a last one, which could have been even longer, and then it would take much more than a story like this to count, remember, and do not forget. Anyway, the numbers are erased in real time, in these exact hours. Like the twenty-six killed from a Saudi raid in Yemen. Let all the raids of this world be damned. Twenty-six, that’s right, as the children who according to the United Nations disappear every day in Afghanistan because of a normal illness such as diarrhea. This is the name of the lost story. Note it somewhere, the human events that lie behind the missed appeal, and forgive us, if we were absent from the count, but we are justified.